Syria, Israel Reopen Quneitra Crossing In Golan Heights First Time In Four Years 5 out of 5 based on 7 ratings. 7 user reviews. 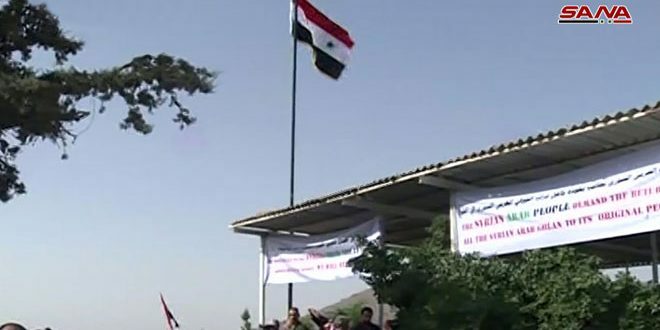 On October 15, Syria and Israel reopened the Quneitra border crossing in the Golan Heights for the first time in four years. The Syrian flag was raised at the crossing, and as it reopened, the UN peacekeeping force UNDOF sent a number of white trucks from Syria to the Israeli-held area. Maj. Nehemia Berkey, the Israeli liaison to UNDOF, told media that the reopening of the crossing “symbolizes the return of the enforcement of the 1974 disengagement agreement [between Israel and Syria]”. On the same day, a crossing between Syria and Jordan was opened for the first time in three years. The reopening of the crossing allows the sides to restore free movement of civilians and good between the sides. The reopening of Naseeb is major financial relief to the Damascus government by restoring a much-needed gateway for Syrian exports to other Arab countries. The resumption of commercial trade is also a diplomatic victory for Syria and its allies. Furthermore, the reopening of the aforementioned crossings shows the de-escalation of the situation in southern Syria in general, a move for a long time supported by the Russian side. It seems that despite all the speculations in the mainstream media, the Syrian-Iranian-Russian alliance has emplyoed a right appraoch and achieved an important victory in the area. The Golan Heights belong to the Syrian people, not a tribe of thieving warmongering, genocidal maniacs. The Syrian people live there and much better then under arabs and their arapnafobics. Jordan and most of Israel are Syria as well just divided by French and Britts. You not even liberated and created those borders Yourself. So why dont You go into the real world. If You want changes into it was, You should ask the Ottomans to take over again. I have heard about all Your ME crap, which was made long time before I was born. Its exact the same taking patents on this and that ignoring a lot of others facts, which also was for real long time before I was born. Why dont You go on with Your life removing the agressive private ownerships such as fx Baathistas. They set You up against others, so You accept, they kept You illiterate low devellopped overpolpulated poor. If You develloped as the jews, You could buy the world. it was europe and the zionists that left behind a mess after the fall of the ottoman empire. Syria was under direct control of France. It was France that reintroduced sektarian violence in the region once again by dividing the population, this to prevent the people to unite and take arms against the french. and your last line shows how simple minded you people are. we are all humans, there is no difference between any of you. only brainwashed people stand behind flags & religion and think they are better then others. treat others as subhumans. remind me of hitler. . you cleary havent seen the light yet. if you think its all about $$$, then yer just like all other sheep trapped in the capitalism system. and stop attacking people like that when you only have BS to add. Sorry, I disagree, Israel will use it to infiltrate Syria and commit terror attacks. Remember all the things that were said in the comments section here during the Battle of Daraa about the Golan was next? No, of course you guys don’t. I can remember saying that now was not the time. Eventually Israel will be forced to give up the land it stole, but not yet. Right now, I’m curious as to what the scam is, Israel would only do this to benefit Israel. Israel has proven time and time again, that is an unscrupulous criminal nation. It would be safer for Syria if the border remained closed.